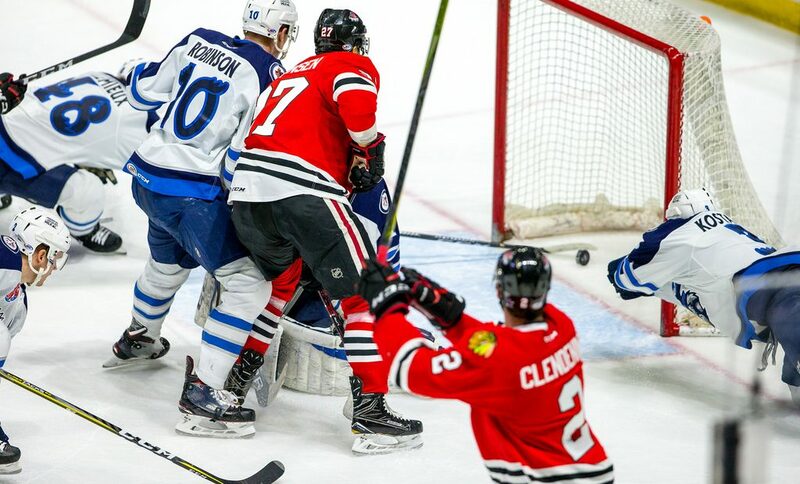 The Rockford IceHogs get the Central Division Final underway tonight when they take on the Manitoba Moose at Bell MTS Place. Game 2 follows in short order on Saturday. From there, the action comes to the BMO Harris Bank Center for the next three games in the series. The piglets are well-rested, having played last in Chicago eight days ago. Manitoba finished off Grand Rapids back on Monday in Game 5 of their first-round tilt. As mentioned earlier this week, Rockford has never advanced to the third-round of the Calder Cup Playoffs. This is a series the IceHogs is quite capable of winning, though. Here are some thoughts on the Moose and how this match-up figures to play out. Manitoba was the juggernaut of the AHL in the 2017 portion of the schedule. The Moose were 24-6-1-2 in the first three months of the season, building a double-digit point lead in the Central Division. That cushion would evaporate in the final three months. 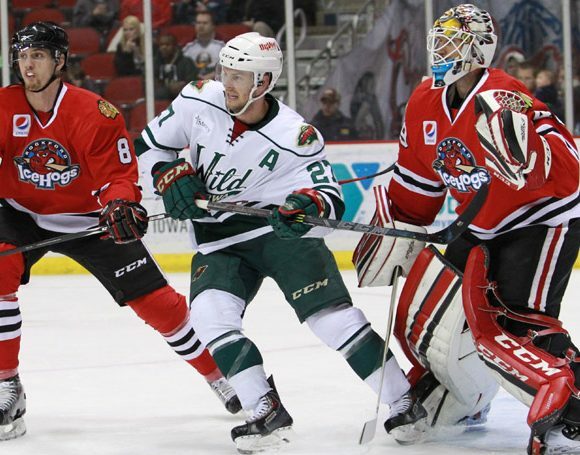 Chicago and Grand Rapids caught Manitoba in the final two weeks as the Moose staggered home. I was pretty bold in my belief that Grand Rapids would come out of the first-round clash. However, Manitoba was able to take advantage of some missing pieces to the Griffins lineup and played well on the road. They won two of three games at Van Andel Arena, including a 5-1 Game 5 triumph. Manitoba can boast the AHL Coach Of The Year (Pascal Vincent), the AHL Defenseman Of The Year (Sami Niku) and the AHL Rookie Of The Year (Mason Appleton). The Moose proved their playoff mettle; this is physical team that can fill the net. The Manitoba roster is also dotted with AHL veteran talent enjoying career years. Specifically, captain Patrice Cormier (22 G, 21 A), 6’6″ wing Buddy Robinson (25 G, 28 A) and former Hogs defenseman Cameron Schilling (6 G, 26 A). 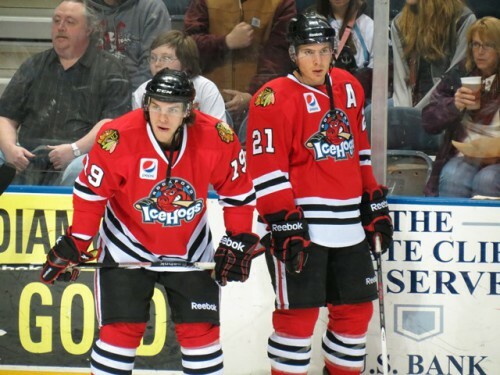 Forward J.C. Lipon is a familiar face who had a hat trick in Rockford November 28 on the way to a career-high of 17 goals. Niku, who totaled 54 points (16 G, 38 A) on the season, would have likely taken home rookie of the year hardware if not for Appleton, who led the Moose with 66 points (22 G, 44 A). Manitoba is a talented squad despite the fact that their best hockey was played in the first three months. The Moose visited Rockford November 28. at the peak of their tear through the league, blowing out the Hogs 8-1. In a return visit February 2, Rockford took Manitoba to overtime before losing 4-3. Late in the season, the IceHogs traveled north for a pair of games in Winnipeg, besting the Moose 4-2 and 4-3 in the span of three days. Anchoring the Manitoba attack in the first half was goalie Michael Hutchinson, who finished season with a 17-5-4 record to go with a 2.08 GAA and a .935 save percentage. Hutchinson spent most of the second half of the season with Winnipeg, though he was in net March 28 when the Hogs dropped four goals on Manitoba. The man Rockford will be facing in net in this series is Eric Comrie. While he is a bit of a drop-off from Hutchinson, Comrie still enjoyed his best full season in the AHL with a 2.58 GAA and a .916 save percentage. He was in the cage in Rockford February 2 for the 4-3 overtime win. Adam Clendening (1 G, 5 A) and Chris DiDomenico (1 G, 5 A) each had six points against Manitoba this season, though two of DiDomenico’s helpers came while he was with Belleville. 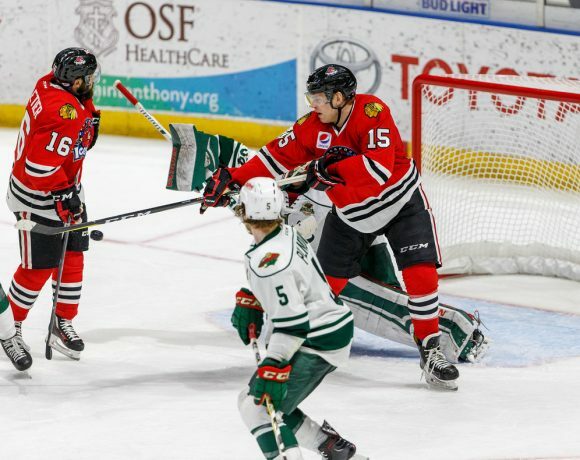 Tyler Sikura had three goals against the Moose and had two-point efforts in both of Rockford’s victories. Brenden Lemieux paced Manitoba in head-to-head competition with the IceHogs; in three games, Lemieux wound up with six points (2 G, 4 A). Along with Lipon, Cormier, Appleton, C Nic Petan and D Jan Kostelnek were all mutli-goal scorers against Rockford. Any special teams comparisons from the regular season can be thrown out the window. Here’s all you need to know in regards to the Hogs; their first-round power play was the best of the 16 playoff teams at 38.9 percent efficiency. The penalty kill (85.7) was fifth. When it comes to the man advantage (and even strengh, to be honest), the Rockford offense is going to be facilitated by the passing and shooting of defensemen Clendening (16 shots in the three-game set with Chicago) and Cody Franson (12 shots). Can the depth boasted by the Hogs NHL-enhanced roster wear down Manitoba over 60 minutes? Will Collin Delia, who was rock-solid in round one, continue to stand tall in net? If the Moose shut down Rockford’s veterans, can the kids pick up the slack? The answers will begin to take shape this weekend. Follow me @JonFromi for thoughts and updates of Games 1 and 2.